How often does a school without an Archaeology department sponsor and execute the excavation of an Archaeological site? I would think not so very often. But nevertheless, Azusa Pacific University, in partnership with Hebrew University and under the leadership of their very own scholar Dr. Robert Mullins, is preparing to begin the excavation of Abel Beth Maachah in Israel near Dan, close to the Lebanese border. Abel Beth Maachah, mentioned in Samuel and Kings in the Bible, is among the last un-excavated biblical sites in Israel. There's tons of potential in the site but due to its lack of fame and proximity to Lebanon, nobody's touched it yet. Well, Bob Mullins is about to touch it. APU is, of course, my Alma mater where I had the privilege of taking five semesters of Hebrew, four of which were with Dr. Mullins. 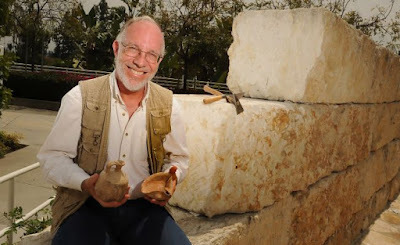 In 2008, just after I graduated, I had the distinct privilege of going to Israel for a summer with Dr. Mullins, spending the final two weeks of our trip excavating a site called Tel Rehov. Going to Israel is amazing enough, but going to Israel with Bob Mullins is like nothing else. The man just knows the place like it's his own brother and he loves to share it with people. And diggin with Bob is like digging with Indiana Jones (minus the whips, the booby-traps, the Nazis, and the fist-fights... ok, so it's not much like Indiana Jones at all). You just can't stump the guy! Needless to say, I am very excited for APU and for Dr. Mullins as they embark on this adventure with Hebrew University. Hopefully, before they're done I'll get a chance to go shovel some dirt with them over there. In any case, I am very excited to see what treasures they can dig up. Read the article in the San Gabriel Valley Tribune (which is where I got the picture at the top).